Pretty Little Liars Review: Don't Rock the Boat! After a promising start to the second half of the season, I was a little let down by this week's episode of Pretty Little Liars, "A Hot Piece of A." There was plenty of drama, danger and even a little romance, so we had plenty to enjoy. However, I just didn't buy the whole Lucas plot. I've always been a fan of that adorably geeky guy, and I can't believe he's the newest suspect. Let's start with the relationship drama. It's bad news for Ezria fans! Aria still seemed pretty optimistic about their future, despite the looks of anger, betrayal and disappointment her parents kept throwing her way. Ezra was a little more realistic, especially after Byron stopped by for a little visit. Chad Lowe did an amazing job with this scene! The whole exchange was tense and totally believable. As a father, Byron has trouble imagining his little girl as someone who is capable of being in love, like any father of a teenage girl. This problem was made even worse when he sees his daughter with a grown man like Ezra. You could see his imagination running away with him as he suddenly noticed his daughter's outfits (totally against any school's dress code) and caught a glimpse of Ezra's rumpled bedsheets. Luckily, his wife reigned in both his imagination and anger, so it doesn't look like Ezra will be going to jail anytime soon. However, Ezra still understands the seriousness of the situation. Aria will be a little harder to convince, as we've already seen her set up her next plot to trick her parents. I don't think lying to her parents is the smartest thing to do now. Damaging their trust in her (what little they have left) will only make things worse. Why can't she just wait until she's legally an adult? There was a brief Spoby reunion this week, which mostly served as an opportunity for Spencer to overhear an argument between Garrett and Jenna. There's a little trouble in paradise for this newly outed couple, but what's the cause of this friction? Garrett said Jenna turned on him, which wasn't surprising to Toby. It didn't seem like your average couple fight, and their possible breakup could open up new opportunities for the girls. Did anyone else think Garrett was referring to Jason in that fight? Other than the cute moment she had with Toby, Spencer spent most of the episode being annoying and bossy. As I've mentioned before, Spencer is always quick to accuse someone of being A or working with A. Each time there's a new suspect, Spencer immediately believes that person is guilty. She did the same thing with Lucas this week, badgering Hanna about one of her closest friends. It was bad enough that Spencer insisted on having Caleb work on the phone, despite the fact that she keeps Toby safely out of the A-madness. Sometimes I can't imagine why the girls would be friends with someone who can be a little selfish and stubborn. Then again, they were all best friends with the meanest of mean girls: Allison. 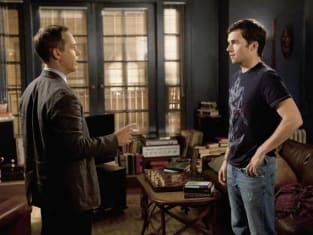 Spencer wasn't alone in thinking that Lucas was somehow involved with A; Emily spoke to Lucas on the crisis hotline and immediately became suspicious of him. BUT everything Lucas said on the phone was so vague! If they were a little more observant, I'm sure they would have come to a much different conclusion. Since Caleb came back, Lucas has been keeping his distance, seeming almost tortured when he has to spend time with Hanna. It's no secret that he has a crush on her, and he's been a wonderful friend to her even though she doesn't return his feelings. It's more likely that Lucas has gotten tired of being stuck in the "friend zone" and wants to distance himself from Hanna. Even though the whole boat scene was suppose to be ominous and scary, all that spookiness (fog machine and all) seemed artificial and forced. 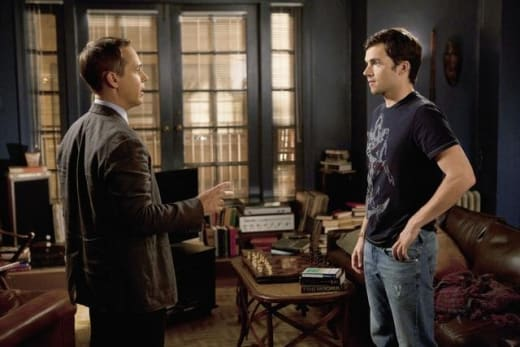 Lucas's anger and nervousness could be the result of a major emotional decision - to cut Hanna out of his life. Unfortunately, Hanna didn't wait long enough to hear anything he had to say. Now, poor Lucas is missing! Did Lucas drown? Could he be A's secret partner? Take a look at next week's episode now for a few clues. These are not highlights, Hanna. This is glass in my hair. Permalink: These are not highlights, Hanna. This is glass in my hair. Spencer, stop giving us orders. We're not your winged monkeys. Permalink: Spencer, stop giving us orders. We're not your winged monkeys. Pretty Little Liars, Pretty Big Fight: Byron vs. Ezra! Pretty Little Liars Promo & Clip: "A Hot Piece of A"